Replace the $1 bill with a $1 coin and the U.S. government could save $5.5 billion over 30 years. That’s what the Government Accountability Office reported March 4. It’s a recommendation the GAO has made four times over the past 20 years. Back in 2000, it estimated a $522 million annual savings if the coin became the financial vehicle of choice. 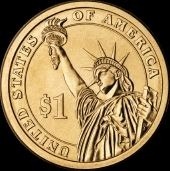 The U.S. government already has $1 coins available for the public to use. It’s just that folks haven’t really taken a liking to them. There are five different $1 coin designs in circulation: the Eisenhower coin, the Susan B. Anthony coin, the Sacagawea coin, the Presidential series and the Native American series. From 1979-2009, 4.213 billion of the $1 coins have been placed in circulation, according to the GAO report. And about 1.1 billion $1 coins are held in storage by the Federal Reserve banks because of the limited public demand, according to Federal Reserve officials. Governments favor replacing bank notes with coins because of lower production costs. The Canadian government estimated it saved $450 million between 1987 and 1991 by replacing notes with coins. However, the latest survey conducted by the GAO shows that 64 percent of Americans prefer the $1 note to the $1 coin. “We have previously recommended to Congress replacement of the $1 note with a $1 coin and, in view of the ongoing significant estimated federal financial benefit, continue to support this prior recommendation,” the report concludes.